Dr. John H. Watson has returned from war. After years of service in the Army Medical Department, Watson is ready to settle down. He has had enough excitement and witnessed enough suffering to last a lifetime. But he is in need of some cheap lodging and his friend Stamford recommends that he room with a Mr. Sherlock Holmes of 221B Baker Street, London. Shortly after moving in with Holmes, Dr. Watson comes face-to-face, once again, with death. Sherlock Holmes is a self-taught detective and a self-proclaimed expert in the “science of deduction”. So, it surprises Dr. Watson that detectives Lestrade and Gregson would consult Sherlock Holmes about the recent death of a gentleman named Enoch J. Drebber. He was found dead on the floor of his front room with a pack of cards in his pocket. Upon inspection, Lestrade discovered the word “RACHE” written in blood on the wall although there was no fresh blood on the victim. Gregson and Lestrade cannot make heads or tails of the case, but Sherlock Holmes knows who did it. This was the first Sherlock Holmes story I have ever read. I had seen some film adaptations of the stories, but I much prefer reading a book first before watching the movie. The first half of the story was very captivating. Holmes, Lestrade, and Gregson make one discovery after another. But, suddenly, the tone of the story changes. Watson stops writing in the first person; instead, the second half of the book is written in the third person omnipresent. Near the end, the story goes back to being told from Watson’s perspective. The truth is that I lost interest in the story after the first half of A Study in Scarlet because the murderer is arrested before part 2 of the book even begins. I was surprised that the murderer is revealed so early in the story. I think much of my disappointment has to do with the fact that I kept comparing this mystery to Agatha Christie’s Hercule Poirot mysteries, which I enjoy. A Study in Scarlet is also filled with stereotypes and obvious misunderstandings about the Mormon religion. Sir Arthur Conan Doyle presents the LDS Church as a cult run by some very frightening and controlling Elders. I couldn’t help but roll my eyes a few times. While A Study in Scarlet was not a terrible story, I recommend the recent (2010) BBC version to the book. The BBC version leaves out the Mormons, and the murderer is revealed at the end of the show rather than in the middle. You really experience the adrenaline rush that I believe should come with reading a mystery. That being said, I have not given up on Sherlock Holmes. 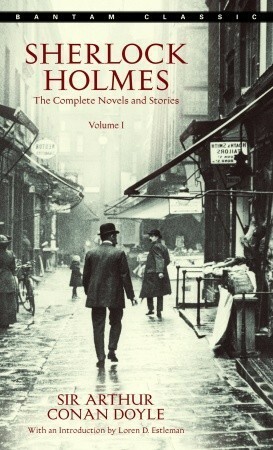 I hope to read more stories from the two volume set. Hopefully they will get better. “Very interesting reading it might be made, too,” remarked Sherlock Holmes , sticking a small piece of plaster over the prick on his finger. “I have to be careful,” he continued, turning to me with a smile, “for I dabble with poisons a good deal.” He held out his hand as he spoke, and I noticed that it was all mottled over with similar pieces of plaster, and discoloured with strong acids.